The road into the Sassi di Matera was built for donkeys, not speeding minivans. But my taxi driver punches the accelerator, and our top-heavy shuttle teeters around another curve. The sun has just set, so it’s hard for me to make out the slanted terrain. The right side of the vehicle squeaks past the edge of a house built into the cliff. I peer out the opposite window and see nothing but a deep, black ravine. We lumber to the crest of the moonlit stairs, which descend to a narrow landing carved into the ridge where a stone path twinkles with candles. I breathe a sigh of relief that I’mnot being dumped on the side of the road. The driver bids me “Arrivederci!” and I let myself in through a squeaky iron gate. I stop at a heavy wooden table draped with a linen runner that flutters in the breeze. I knew that Sextantio Le Grotte della Civita (rates from $350; Via Civita 28; 800.337.4685) had been converted from caves—the name means “city caves.” But nothing had prepared me for the rawness of the landscape, the primitiveness of place. Matera is a remote town on the road to nowhere in the mountains of the Matera province in the region of Basilicata (originally Lucania), where until last year there was not a single luxury hotel. Now there are two, the latest and more expensive of which is Sextantio. 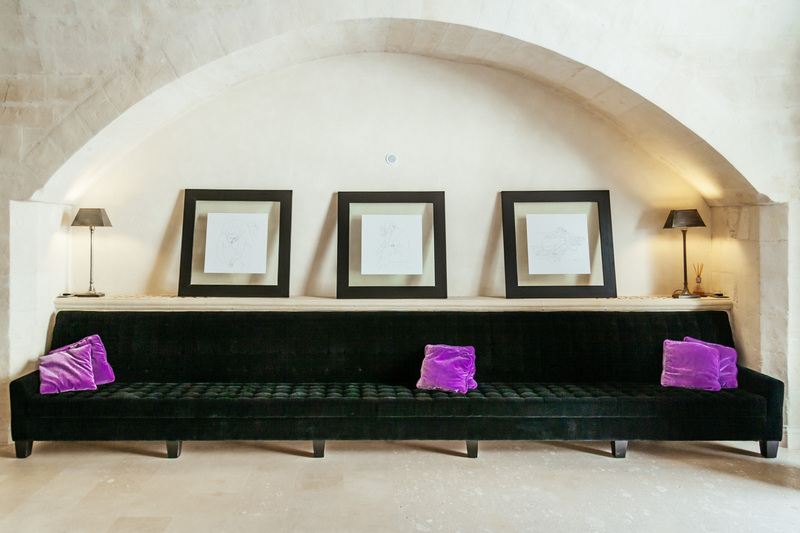 The hotel enjoys a dramatic perch overlooking a ravine in the Alta Murgia National Park but does not offer a view of Matera itself, leaving my imagination to run wild in the dark. The woman in the linen tunic leads me along the candlelit path around a curve in the cliff’s slope. We climb a narrow flight of stone stairs polished by thousands of years of footsteps. She slides a skeleton key into the clunky lock and turns it, then pushes open the heavy door. “Do you like your suite?” she asks. I find myself impotent for language, able only to nod my head in awe. I’m struck by the absolute void of color and sparseness of furnishings. A wooden chest lies next to the door. On it, a vase is stuffed with fistfuls of herbs, lending an invigorating scent to the air. Five steps up from the foyer, the living room stretches long and wide, with a slender bench and wooden table draped in linen at the far end. A thick board protrudes from one wall—a rudimentary sofa of sorts—and next to that, a burlap cushion is slumped into the corner. It is unconventionally luxurious. Beautiful. “There is no television or telephone, I’m afraid,” the clerk says, smiling. There are also no closets or armoires—just a few iron hooks hammered into the rock along with a few hand-whittled hangers. The walls, the floors, the ceilings, the stairs each express a unique variation of the same yellowish white sandstone. There is no art, nor any need for it. The floors are an uneven hodgepodge of bricks and bedrock. A small doorway, if I can call it that, has been crudely chiseled through the solid rock wall leading into another room, my bedroom, which is empty but for a king-size bed with fluffy pillows and crisp linen sheets and a couple of rickety wooden side chairs. The bathroom is divided into two chambers on opposite ends of the suite. An elevated loft off the foyer holds a matte-finished Philippe Starck bathtub and a wood-burning fireplace with a soot-stained hearth. A nook at the opposite end of the cave hides the vanity, modern toilet, bidet, linen finger towels and the air-conditioning controls. There’s a knock at the door. It’s room service. Two more tunic-clad women shuffle in carrying trays so large they have to pass through sideways. Within an instant, the duo has transformed my empty table into a sumptuous spread (while also turning down my bed). The hotel’s idea of a welcome snack and aperitif: a platter piled with slices of rustic bread and freshly chopped tomatoes, plus a bowl of the reddest, sweetest watermelon I’ve ever tasted. They’ve brought fine crystal stemware, a pitcher of cold water and a bottle of red wine, a robust, juniper-tinged Aglianico from a nearby vineyard. Tomorrow I will learn that the tomatoes and melon were picked in the hotel’s garden, a scruffy plot of dirt one level up from my suite. I scrap plans of exploring the town in search of a late-night trattoria, content to curl up on the burlap cushion with my wine and bruschetta. Sextantio is the creation of conservationist Daniele Kihlgren and his partner Margaret Berg. I serendipitously befriend Kihlgren the next morning at breakfast. We’re both eating alone in the hotel’s sun-dappled dining room, a high-ceilinged cave that originally served as a church and later someone’s home. I’m comfortable eating alone, but Kihlgren clearly is not. Restless after a second double espresso (four spoons of sugar in each), he walks over tentatively and introduces himself. Kihlgren is in his mid-40s with pale, freckled skin and reddish-brown hair. I learn that he’s the grandson of a Swedish diplomat and Italian grandmother whose family amassed a fortune in the cement business. He was born in Italy and makes a point of declaring his national pride. Had he not introduced himself, I never would have pegged him to be either Italian or rich. His white cotton shirt is untucked and severely crumpled. He hasn’t shaven in days. I’m not sure he’s slept, although his unruly hair suggests he has just woken up. He’s now on his third espresso, rattling off details about the hotel’s extensive restoration, of how the plumbing, the electricity and the heating that runs beneath the floors had to be completely hidden. He explains how only original architectural materials—local stones, bricks, doors, hand-forged iron—were used to restore the damaged areas. The basic integrity of the caves remains otherwise unchanged—just far more comfortable. Kihlgren’s mind jumps from one thought to another, and he desperately races to keep up with his stream of consciousness. The conversation rapidly veers from religious history to stories about riding a motorcycle across Africa and shacking up with prostitutes in Cuba. With Vivaldi echoing softly off the dining hall walls, Kihlgren caresses the tablecloth and explains that the linens used throughout the hotel were collected from antique chests around the region. It becomes poignantly clear that Kihlgren cares deeply about the disappearing heritage of Italy’s rural hill towns. He’s got several other projects in the works but doesn’t want to talk about those until they’re ready. For someone who’s not in the hotel business, he sure understands luxury hospitality. The service at Sextantio competes with any of the world’s finest hotels—even if the paradigm has been flipped upside down. After breakfast, I set out to discover Matera. I find a path behind the hotel and follow it up the hill toward the city. It’s a steep, dusty path that morphs into a cobblestone street that tunnels between medieval buildings, which grow grander as I ascend. I round a final turn at the top and come upon Piazza Duomo, a public square framed by a 12th-century cathedral and bell tower where several sightseers have gathered, yet none of them is looking at the impressive church. Instead, they’re all staring—mesmerized—in the opposite direction. I turn. I freeze. The duomo and surrounding palazzos overlook a deep valley whose every inch is crowded with monochrome dwellings, built up and around the former caves, their sunbaked faces blending into each other, precariously stacked like dominos. A single road zigzags up, around and down. There is a slight breeze and a meditative silence blowing up through the valley. I climb onto a retaining wall and try to soak it in. I later meet up with a local guide, Dora Cappiello, who gives me a private tour of the only town her family has ever called home. For hundreds of years, these slums were populated by peasants. The noble classes lived up above, their palazzos and cathedrals forming a crown at the top of the mountain. In the Roman period, this noble center of the city was walled off from the Sassi to prevent the peasants and barbarians from entering. These were the peasants who time forgot—left behind by the Industrial Revolution, never educated and forever resigned to a life of hopelessness. As far back as anyone remembers, the life lived in these slums was one of abject poverty and squalor. The residents retained no earthly possessions other than a large bed, rudimentary cooking equipment and primitive farm tools. Anything of value had been confiscated by tax collectors generations ago. Most shockingly—even as modern life evolved in other parts of Matera—no walls of division ever rose up between the life of man and the lives of animals in these grottos. Until the 1950s, these simple dwellings were occupied simultaneously by humans and farm animals. Several members of the family slept in the only bed. Everyone else, typically the youngest boys, slept on the floor—which was covered with hay and manure—alongside goats, pigs, donkeys and chickens. Cisterns captured rain for drinking, but most of the water had grown toxic. Toilets were unheard of. The plague swept through in the 1800s, followed by malaria in the 1930s. By the end of World War II, the infant mortality rate had risen to 50 percent. And yet the peasants stayed, trapped by circumstance, superstition and witchcraft. It was in the late 1940s that the best-selling book by Carlo Levi, Christ Stopped at Eboli, shed light on this region and exposed Matera as the shame of Italy. Levi vividly described his awful internment in a neighboring village, where he had been forced to live in exile in the 1930s as a political prisoner of the Fascist regime. The whole of Italy was aghast at Levi’s depiction. 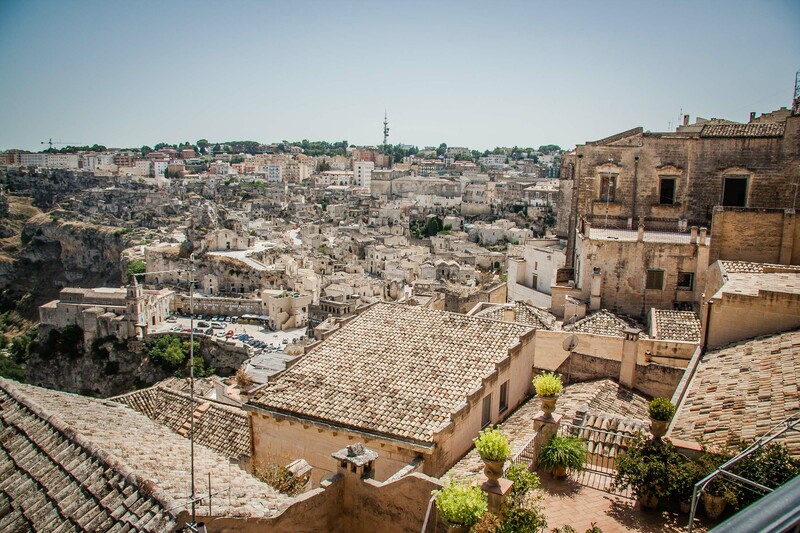 Soon after the book’s release, the new government stepped in and forcibly evacuated more than 15,000 residents—approximately two-thirds of the Sassi—to new housing projects in Matera’s suburbs where residents had long enjoyed running water and modern plumbing. Others, untrusting of authority, voluntarily emigrated to unknown futures in Germany or America. My guide never lived in the Sassi, but her family did. Long before the government intervened and before she was born, her grandfather, a clever craftsman, had earned enough money to relocate his family to the suburbs, where they still live today. “Television was probably the most important development that helped Matera to change,” Cappiello says. Once people began to see that a better life was possible, word spread. In turn, their hearts and minds grew hopeful. And by the time the government stepped in, most were ready and willing to leave. For decades afterward, the abandoned Sassi sat vacant. In the 1970s, the government held a contest to come up with an idea to fix this blight. A Japanese architect drew up a plan to bury part of the village in cement and turn it into a massive amphitheater, which people would travel the world to see. Some local architects ended up winning the contest with a plan to preserve and restore the area, but it remained a project of ideas, not actions. In 1993, the United Nations issued a decree establishing the Sassi di Matera as a UNESCO World Heritage Site—the entire village thus saved. The government now owns most of the property in this quarter, and only lately have wealthy Italians begun moving in, agreeing to long-term rents and committing to preserving the heritage of these homes whose interiors still resemble caves. New Porsches and perfectly restored vintage Triumphs now line the cobblestone streets. Cappiello says her uncle refuses to step foot in the neighborhood today-. Despite its gentrification, the memories are still too fresh. And so it is that my first full day in Matera ends with me staring at my strangely exquisite suite, struggling to picture it crowded with runny-nosed children, women dressed in perpetual mourning, men beaten down by fruitless hard labor, and the chickens, pigs and dogs. I stare at my foyer, where my roller bag seems odd, and try to visualize donkeys sharing my living space. I look at my bathroom and strain to imagine a goat being roasted in that hearth. But instead, all I see is the same vision Kihlgren originally saw in his dreams: one of the most beautiful, most peaceful hotels on earth. I snuggle into my bed, rest my head on a cloud-like pillow, pull the antique linen sheets up around my neck and drift to sleep with a smile on my face. This centuries-old, slow-food attitude pervades most of the city. It’s barely noon when my circular wanderings spit me out in front of a restaurant called Il Terrazzino (Vico San Giuseppe 7), where a throng already waits. I slip past the queue on account of my being alone and willing to sit at a table built for half a person—but with an unobstructed view of the Sassi. The gruff waiters don’t have time for questions, so I order quickly, zeroing in on a mixed grill of lamb, some melon with prosciutto, baked orecchiette with tomatoes and a delicious, irregularly shaped pizza that arrives with a hole burned through the crust where it got too close to the wood fire. It’s here that I taste cantaloupe, I mean really taste it, for the first time in my life. It’s an heirloom variety that’s been grown here for ages. The lamb arrives wrapped in brown parchment like a hobo’s knapsack, which I rush to untie, revealing a treasure of meat: a fatty rib, a great sausage, a giant knuckle, a hunk of thymus and something that looks like tail, which I decide isn’t my favorite. Matera is such a small, remote town that I’m surprised to see how stylishly everyone dresses for dinner, followed by the requisite stroll through the streets and public squares. No question, the town is gentrifying. A United Colors of Benetton recently opened. A MontBlanc boutique, too. Consequently, dinner brings elegant options like the rooftop Terrazza Ridola (Via Ridola 47), where men don bespoke suits and women drip with pearls, and where I can’t get enough of the macaroni tossed with local ham and asparagus cream or an unfussy pork sausage with beans and lardo. Baccanti Ristorante (Via Sant’ Angelo 58-61) serves a chic clientele in a series of caves that unfold beneath arched ceilings. It’s here that I indulge in sautéed foie gras with raspberry marmalade. I pass on the grilled horse rump and opt instead for meltingly tender leg of suckling pig roasted on an open fire. The wine cellar is stocked to the rafters with fine Italian wines, including a vast selection of Prosecco. I find an even more impressive wine cellar at LeBubbole (Piazza Duomo 14a) which can be viewed through the glass floor in its foyer. Le Bubbole is the in-house restaurant at the city’s other new luxury hotel, Palazzo Gattini (rates from $254, Piazza Duomo 14, +039.0835.334358). Chefs here employ a slight hand of molecular gastronomy. Not a lot, but just enough foam and essence to properly deconstruct typical Puglian and Lucanian cuisine. My dinner begins with a creamy tomato flan, progressing to a dish of mashed fava beans with char-grilled red shrimp from Puglia, followed by Podolica beef tortelli in a sauce of Parmesan, figs and almonds. The waiters don’t speak a word of English. But then again, I’m about the only person in town who does. 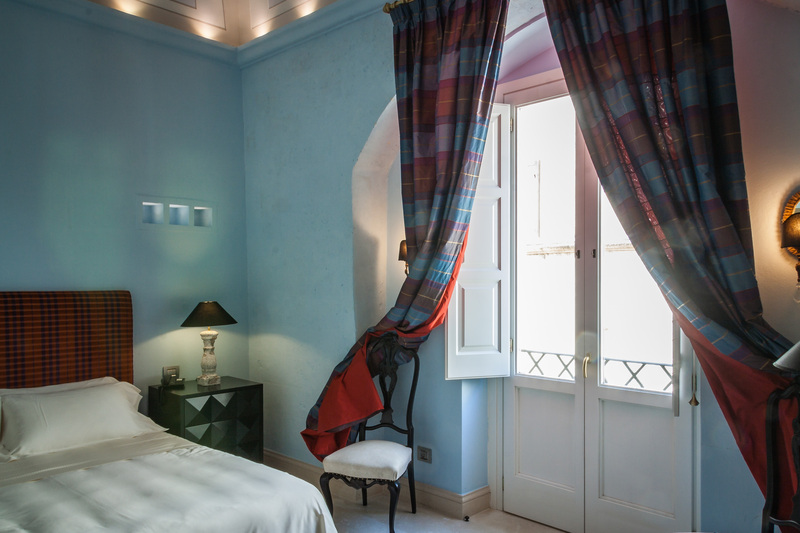 The 20-room Palazzo Gattini, across from the Duomo, towers regally over the Sassi and sits directly atop the medieval wall that once kept the peasants and barbarians at bay. 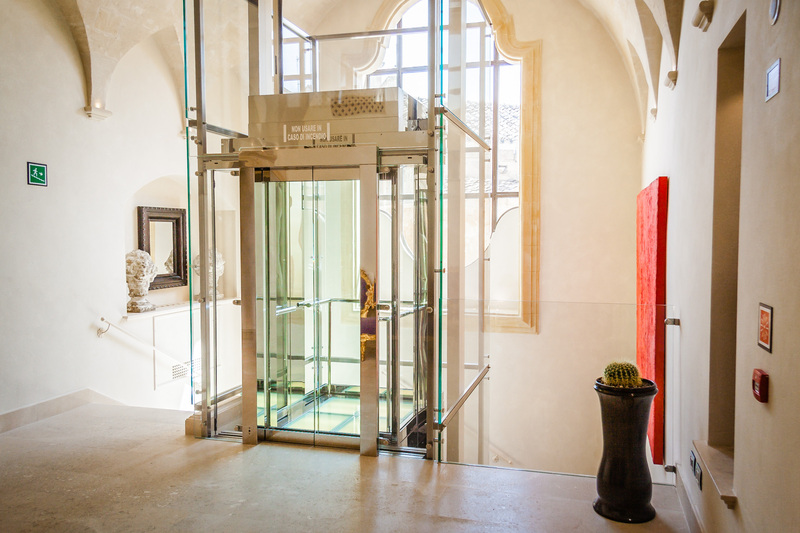 Gattini has been modernized and now boasts a sleek glass-and-steel elevator along with tongue-in-cheek drawings that appropriately depict fat noblemen lounging in a palace. My stay at Gattini is traditionally luxurious. 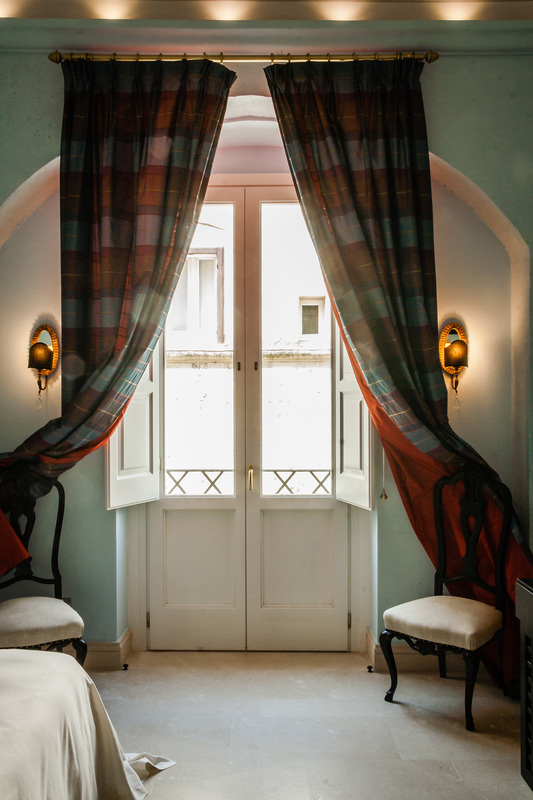 This is the only hotel in town upon which the tourism arm of the Italian government has bestowed five stars, and it comes with all the amenities one expects from a luxury hotel: silk draperies, velvet sofas, LCD TVs, robes and slippers embroidered with the hotel’s logo and—of course—a lovely spa. But no turndown service. Artifacts found in the palazzo’s basement suggest it dates back at least to the 15th century. 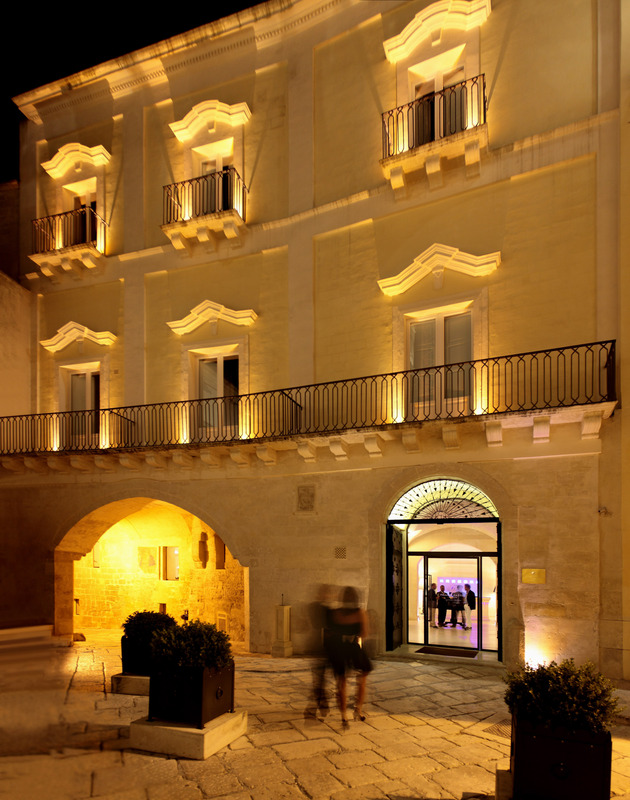 After being partially destroyed, it was rebuilt in the 17th century and inhabited by the oldest noble family of Matera, the House of Gattini. Every room and suite is unique. Peacocks strut across the fresco on the domed ceiling of my standard room, and tall French doors allow me to keep watch over the passageway that leads to and from the former slums—as if I’m guarding the gate. Nightfall arrives much differently from this vantage point than it did on my first night in Matera. From high atop the palace, I watch the sun fade beyond the valley. Porch lights flick on, one by one lighting up the former slums. Church bells ring. I’m perfectly content to live like a count here at Gattini. I’m on top of the world. And I’m guessing some spoiled travelers will prefer this hotel to the more rustic, minimal Sextantio. But the service in the cave is much more doting than here in the palace. And as I look around at the material excesses comforting me, I can’t help but feel homesick for the sublime simplicity and individualized pampering of the grotto. That’s the poetic irony of Matera’s most recent wave of gentrification. This time around, the peasants win.